The Garmin Drive range of Sat Nav is the basic range where the focus is on providing directions at the cheapest possible price point. This means that you’re getting a navigator that has been designed without all the extra features and simply focusing on a navigator that helps you get from Point A to Point B with great maps and traffic updates. 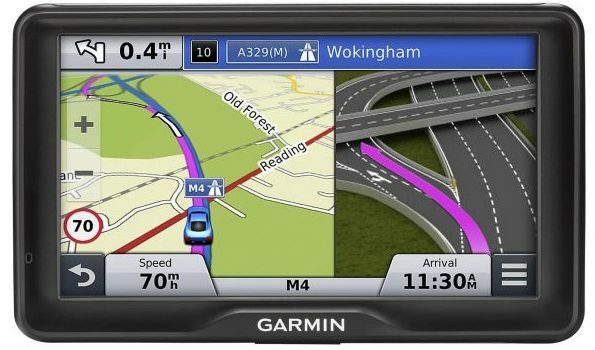 Across all the Garmin SatNav reviews, we have talked about the introduction of Garmin all new Satellite and Digital signal inputs. Digital does work better than Satellite, however its much more expensive. Within the Drive range, you only have a choice of the 51LMT-S with a 5-inch screen and the 61LMT-S with a 6-inch screen. Both models are designed as a cheap satnav and therefore do not come with a digital option. Switching on the satnav, it powers up very quickly given the limited features within the unit. Once you have entered your destination, your route is calculated quickly with step-by-step directions on screen. Directions are great and we like the dual-orientation screen, however what we especially like is the maps which are the same as you’re getting in the more expensive models such as the Garmin DriveLuxe which cost more that three times the price of the Drive. Whilst this maybe a basic model, the maps are great and packed with useful information. Obviously we would recommend that you buy the 61LMT-S that comes with a six inch screen as it makes viewing all this detail much easier than with the five inch screen where whilst you can still see the detail, you just cannot see it as well. Unlike many of the more expensive models the Drive range is not a pinch&zoom screen and instead requires you to press zoom buttons in and out. Whilst it’s a little fidgety, the zoom function does work as expected unlike on previous models where you always found yourself zooming in too much as the unit could not keep up with you. Features are however limited. Whilst this is as expected with the cheaper design, you do get free lifetime map updates, lifetime traffic alerts, some basic driver alerts and access to Garmin’s live data by connecting your smartphone to your Garmin Drive and access things like parking availability and pricing. We also like the fact that your getting access to Trip Adviser which gives you access to millions of potential points of interest along your route and useful customer reviews to help you make a great decision of where to go. Whilst this has been designed as a value for money option, the Trip Adviser is the same Trip Adviser that you get with the more expensive models such as the DriveSmart or DriveAssist. Overall, the Garmin Drive is a fantastic, value for money satnav that does everything you want to help you get from point A to point B. Quite frankly we would have put the Drive in our best sat nav 2018, however the lack of features does not suit everyone.